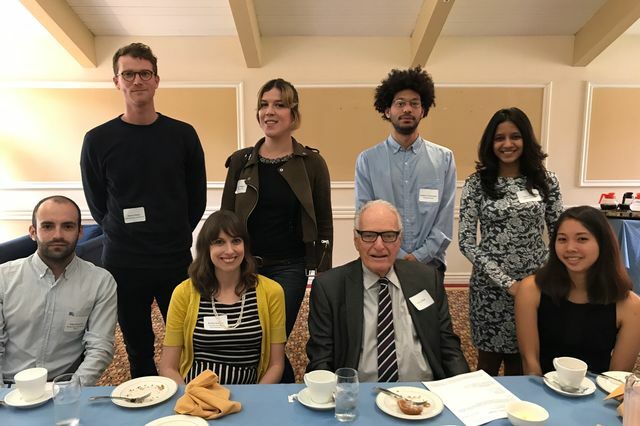 Jerry Moss (seated, second from right) with Rachel Barchie, Moss Foundation executive director (seated, second from left), and UCLA’s 2017-18 Moss Scholars. A gift of $1 million from philanthropist, art collector and A&M Records co-founder Jerry Moss will secure the future of UCLA’s Moss Scholars program, which for the past 15 years has provided full scholarships to art and music students. 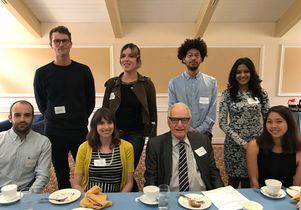 Because it will fund student scholarships, the donation triggered a matching gift of $500,000 from the UCLA Chancellor’s Centennial Scholars Match program. Designed to attract diverse creative voices and practices to UCLA, the Moss Scholars program has already benefited 30 undergraduate and graduate students in the UCLA School of the Arts and Architecture and the UCLA Herb Alpert School of Music. The scholarships cover students’ full tuition throughout their entire degree program at either of the two schools. Donations from Moss have funded the scholarship since its inception, but the new gift and the matching funds will create an endowment that ensures the program can continue in perpetuity. The Moss Scholars program can be especially valuable for international students, who incur additional travel and related costs to attend UCLA. One of the scholarship’s beneficiaries is acclaimed media artist Refik Anadol. A native of Turkey, Anadol earned his master of fine arts degree from UCLA in 2014. (The campus’ graduate arts program is ranked No. 1 among U.S. public universities.) Among Anadol’s recent project was “WDCH Dreams,” a multimedia installation that displayed stunning motion graphics on the exterior of Walt Disney Concert Hall, home of the Los Angeles Philharmonic, for one week in the fall of 2018. Each fall, Moss scholarship recipients gather for a lunch with Moss; the event gives students a chance to meet their benefactor and to engage with one another to discuss their work. Moss co-founded A&M Records with Herb Alpert, the namesake of UCLA’s school of music. Moss is also a patron and collector of contemporary art.